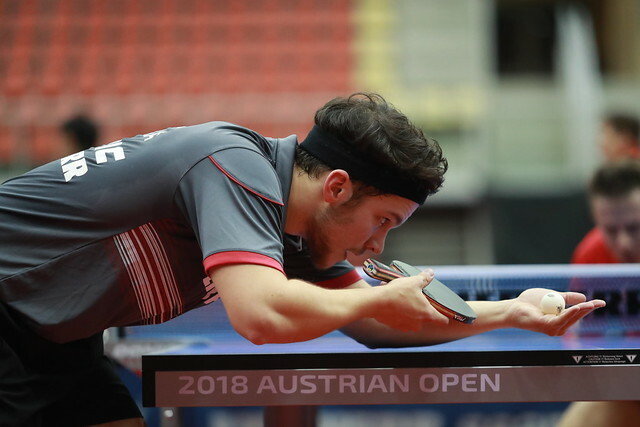 A good draw, it helps; if any pair in the opening round of the Mixed Doubles event at the Seamaster 2018 ITTF World Tour Platinum Liebherr Austrian Open on Thursday 8th November drew the short straw, it was the host nation’s Stefan Fegerl and Sofia Polcanova. The no.8 seeds, runners up in September at the Liebherr 2018 European Championships, they faced a partnership that has never previously been in unison on the international scene but forms the perfect combination; they were beaten by China’s Xu Xin and Liu Shiwen (11-6, 8-11, 11-6, 11-6). Xu Xin, a left handed pen-holder who excels in short play with a pile-driver forehand, combined with Liu Shiwen, right handed and the model of close to the table counter top spin consistent; simply you have the dream team. Defeat for the runners up in Alicante but not for the winners; Germany’s Ruwen Filus and Han Ying, the no.7 seeds, accounted for Hungary’s Adam Szudi and Szandra Pergel (11-5, 9-11, 12-10, 9-11, 11-4). Similarly, there were successes for the pairs who had reached the final at the Liebherr 2017 World Championships in Düsseldorf. Japan’s Maharu Yoshimura and Kasumi Ishikawa, the winners and in Linz the no.2 seeds, beat Spain’s Tiago Apolonia and Shao Jieni (11-9, 11-3, 11-6); Chinese Taipei’s Chen Chien-An and Cheng-Ching, the runners up but the top seeds in Austria, eventually overcame Romania’s Ovidiu Ionescu and Bernadette Szocs. They secured victory by the very narrowest of decisions (11-7, 11-13, 8-11, 14-12, 12-10). Success for formidable pairs, likewise, Hong Kong’s Wong Chun Ting and Doo Hoi Kem, the no.3 seeds, beat Poland’s Jakub Dyjas and Natalia Partyka by the minimal margin (6-11, 11-4, 13-11, 7-11, 11-9). Rather more comfortably, the pairing supported by the ITTF Foundation and Sportsmaster, Korea Republic’s Jang Woojin and DPR Korea’s Cha Hyo Sim, the no.4 seeds, ended the hopes of Belgium’s Cédric Nuytinck and Lisa Lung (11-5, 6-11, 11-7, 11-7). Most significantly, the win recorded by Jang Woojin and Cho Hyo Sim who started the day in the no.2 spot on the ITTF World Tour Mixed Doubles Standings (300 points) have now completed the mandatory two appearance criteria and are thus guaranteed a place in the Grand Finals. It is the same for Chen Chien-An and Cheng I-Ching who started the day in the no.5 spot (213 points), as it is for Maharu Yoshimura and Kasumin Ishikawa who commenced play in Linz in the no.7 spot (175 points). Hard fought wins, life was somewhat more comfortable for Slovakia’s Lubomir Pistej and Barbora Balazova, the no.5 seeds, they accounted for India’s Sharath Kamal Achanta and Manika Batra (11-9, 11-9, 11-9). Notably, the wins recorded by Lubomir Pistej and Barbora Balazova, who started the day in 11th position on the Standings (89 points), keep their hopes of a Grand Finals invitation alive, as do Wong Chun Ting and Doo Hoi Kem (82 points). Similarly, for Ruwen Filus and Han Ying (19 points) a place in Incheon is not out of the question. Meanwhile in the one other first round Mixed Doubles contest, life could not have been less stressful; due to partner Swedish colleague Matilda Ekholm, injury forced Mattias Falck to withdraw, Laurens Tromer and Britt Eerland of the Netherlands, received a walk-over against the no.6 seeds. The quarter-final matches in the Mixed Doubles event are scheduled for 10.00 am (local time) on Friday 9th November.